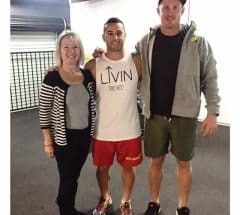 A while back we ran a feature blog with Chris Borgese who is doing a world record pull up attempt on the 22nd January 2017 (read the first interview HERE) in the Gold Coast. Today we get the chance to catch up with Chris and see how he’s been going since we last spoke. Hey Chris, how has the training been going since we last spoke to you? Training is solid. 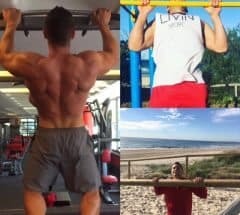 I’ve had a few ups and downs in regards to the numbers I’ve been pumping out with the pull ups. Some sessions I feel like a feather and others I feel like lead. I’m generally fairly consistent though. I see that you have now decided to attempt not just the 6 hour world record but potentially 3 world records in attempting to beat the 6, 12 & the 24 hour marks, how did that come about? Training overall has been going well. I’ve done a couple of 4 hour training sessions and feel like a 6 hour record is achievable. For me, this is a once in a lifetime event. I may as well make the most of it. The other reason is that I don’t feel like I’ve gained enough publicity for LIVIN and thought by doing something this crazy, it may generate some more awareness. Has much changed in your approach and training method since we last spoke? I’ve reduced the weights I was lifting and replaced it with an extra 1 or 2 pull up sessions a week and a Pilates class. Im still lifting but only twice a week but it’s more a circuit training session which doesn’t allow me to rest or recover which can relate to the World Record attempts. I see you now have a set location for your world record chin-up attempt which must help ease the stress leading up to the event, how did that come about? I wanted to do the event at a location where we could get some exposure and have people around me that generally cared for the cause. I originally tried to do it in the shopping centre at Pacific Fair which is the biggest shopping centre on the Gold Coast, however, as that wasn’t feasible, the gym (EMF Pacific Fair) agreed to have me on board which has worked out really well because they genuinely wanted to be involved. Lastly how is the reception going in regards to to spreading LIVINs message, building the funding for the charity and how can our readers get onboard? I wish I could be doing more. I emailed all the local schools and put myself out there to talk for free. I just wanted to do my bit for the community. Over the next 6 weeks it’s about giving as much as I can. The mission was always to raise awareness and not necessarily worried about the funds raised. The readers can get on board by buying a LIVIN shirt which they can get the details from my Chin Up For Charity Facebook page or send through some words of encouragement so I know the message is getting out. Thanks once again for your time Chris, I know you are extremely busy at the moment and best of luck with the World Record attempt from all of us here at Movement Co.
**For those people who want to follow the journey further here are a bunch of links which you can use to get onboard. Follow Chin Up for Charity on Facebook.